There are a lot of battery packs, battery banks, or portable chargers in the market. But very few of them support quick charge capability. 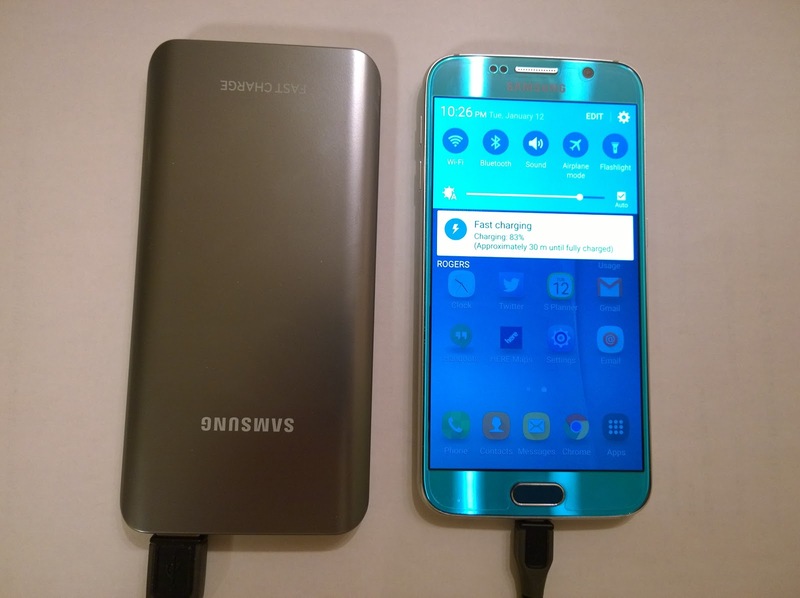 If you have a HTC One M9, Galaxy S6, Galaxy S6 Edge, Galaxy Note 5, LG V10 or LG G4, then you'll want to pick up a battery bank that supports quick charge so you can enjoy more time with your phone and not constantly wired to the battery pack. 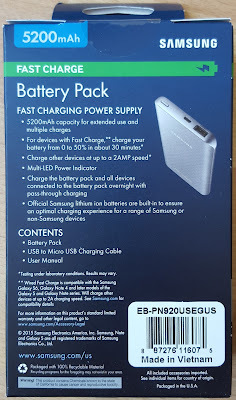 The Samsung Fast Charge Battery Pack is one of the few battery packs that supports Qualcomm's Quick Charge 2.0. That means it'll charge your phone almost as fast your phone plugged into a quick charge wall adapter - up to 50% faster than a non-quick charge battery pack. 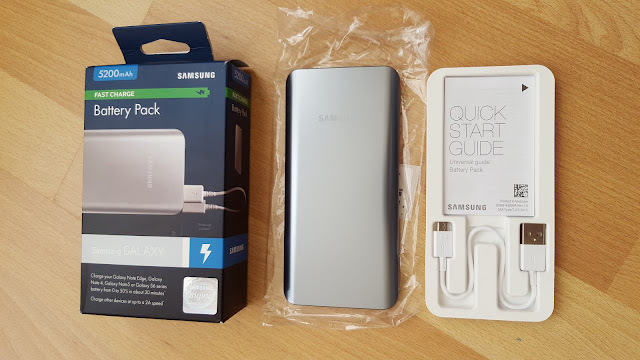 The basics are included: the battery pack and a short micro USB to full USB connector. You'll need to bring your own AC adaptor to charge the battery pack with a wall outlet - unfortunately, you can't wireless charge the battery pack. 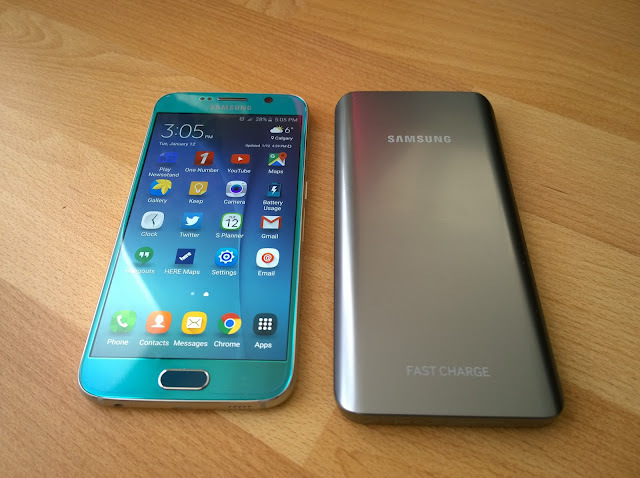 A Galaxy S6 beside the Samsung Fast Charge Battery Pack. The battery pack is just a bit longer and about as wide as the Galaxy S6. The battery pack is aluminum with a smooth anti-fingerprint coating. The edges taper to the sides just like the back of a Galaxy Note 5 making it comfortable to hold in the hand. 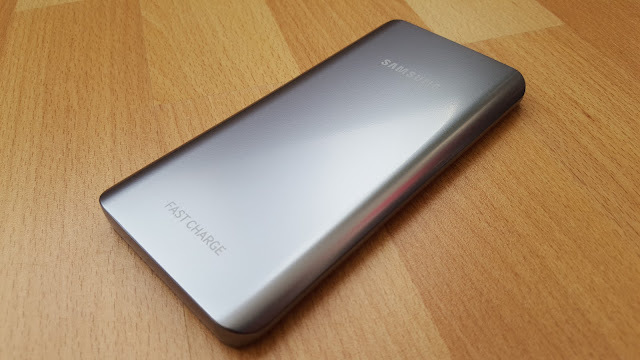 The front only has Samsung and Fast Charge etched in white. It also comes in gold. 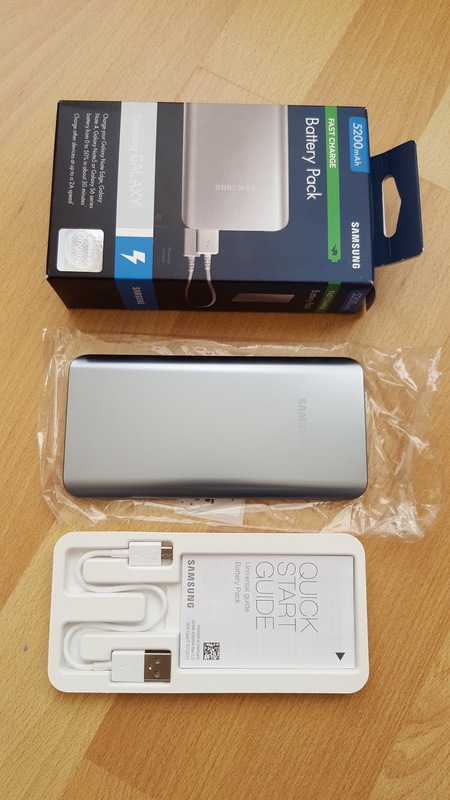 The back looks just like the front but without the Samsung and Fast Charge etched labels and just includes a product and serial sticker. The bottom of the battery pack has on the regulatory labels. The top of battery pack includes the full USB for charging devices (power out), the micro USB for charging the battery pack (power in), the 4 charge indicator LEDs, and the button to light up the LEDs. The LED charge indicator is inaccurate as it was lit 3/4 LEDs but could only charge my Galaxy S6 by 30%. 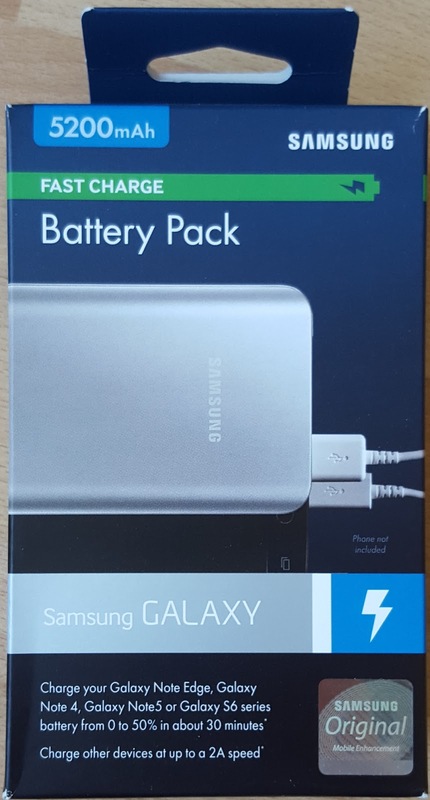 The Samsung Battery Pack is small on capacity at 5200mAh compared to other battery packs of this size and of this price. 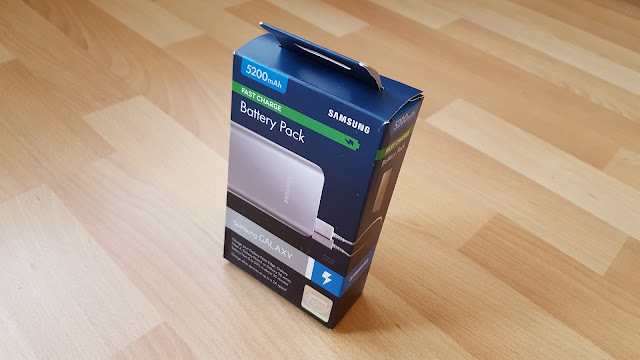 Changing Support for fast charge capability, it can charge a Galaxy S6 (2550 mAh battery) from empty to full a little over 1 hour and 20 minutes. 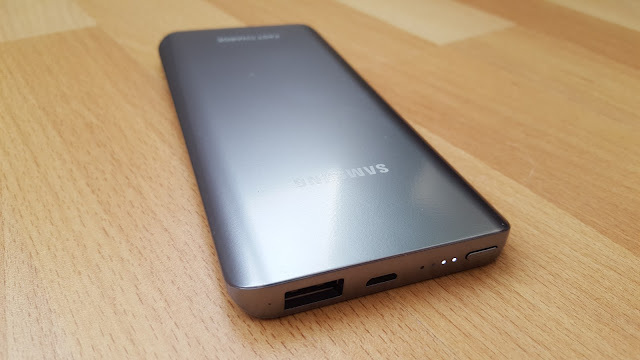 At a capacity of 5200mAh, you would think it should be able to charge the Galaxy S6 from empty to full about 2 times but in reality it can only charge the phone once from empty to full and charge another 25%. Recharging Unfortunately the battery pack does not support fast recharging itself so it'll take about 3 hours and 20 minutes to charge from empty. The Samsung Fast Charge Battery Pack is a beautiful battery pack that resembles an all aluminum Galaxy S6/Note 5. 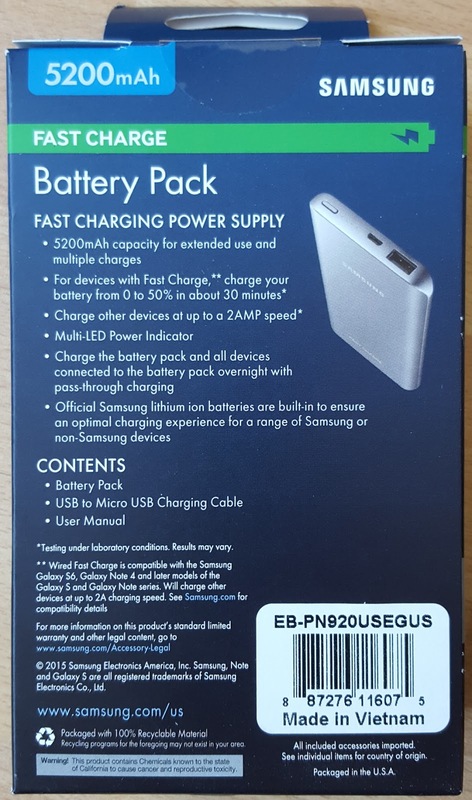 For MSRP, it's expensive for the amount of power it carries but it's one of the few battery packs that supports fast charging devices. But if you're concerned about 3rd party battery banks causing over-current, overcharging and overheating your pricey phone then it's best to stick to products from a big manufacturer. As of this writing you can find this battery pack sold by Amazon for $46 which is a much better price. You should also consider the cheaper Aukey Quick Charge 2.0 10,400mAh.